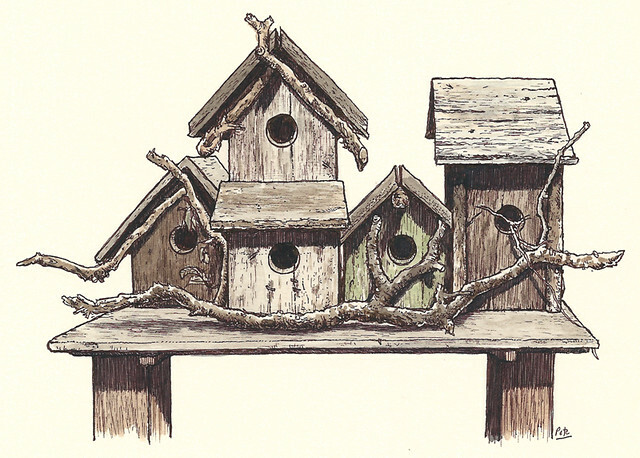 Back in May I did some sketching for the Pence’s Garden Tour, and one of the things I drew was a set of birdhouses which I just loved. I sold the original, and I wanted to draw them again but never got around to it, until now. I drew these lovelies on the Stillman & Birn Delta paper (very nice for these types of things) using the sepia uniball signo um-151 pen (the pen of choice) with a bit of watercolour to wash it. Hey guess what, it’s available to buy in my Etsy store! If you’ve not been to my Etsy store there are several prints and originals for sale, got to etsy.com/shop/petescully.